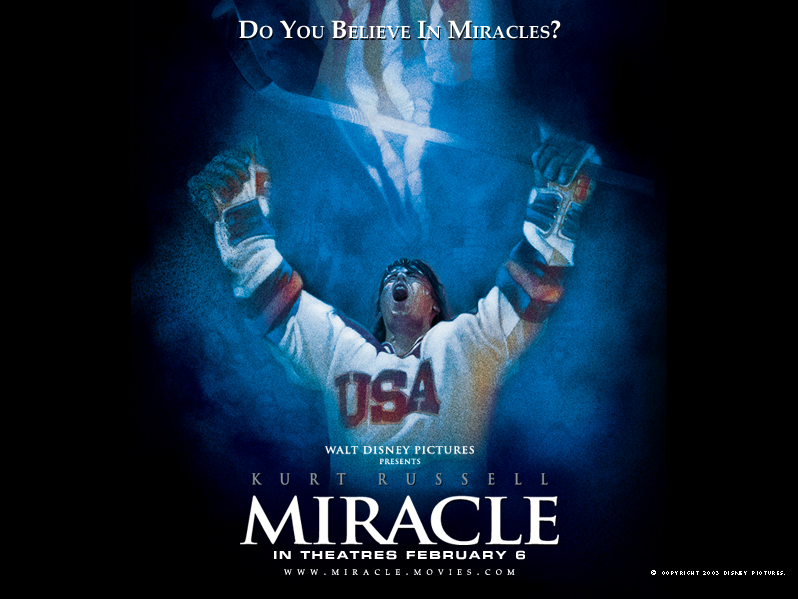 Miracle is the true story of the 1980 USA Men’s Olympic Hockey team. This was before the Olympics were made up of “dream teams,” and it was during a time when the Soviet machine trained athletes like they were soldiers. In fact, many on the Soviet hockey team actually were soldiers. They’d been playing and training together for more than a decade. They won nearly every game. They didn’t just win. They obliterated their opponents. They were a shoe in for the gold medal every year, and the United States was getting beaten by the Czech B team. The US Olympic committee wasn’t even looking to win a medal…and then Herb Brooks happened. I love Herb Brooks. If you watch news footage from the late 70s and early 80s of Brooks, you’ll be struck by two things: A) his absolute abrasiveness, B) the fact that Kurt Russell was robbed when he wasn’t nominated for an Oscar for this role. Herb Brooks was not afraid to curse. He was not afraid to tell you just how badly you sucked. Some of his “Herbisms” became legendary among his players and made it into the film. In spite of how unflinchingly straightforward these Herbisms are – or maybe because of that – I find them incredibly inspirational. Why? Because he absolutely never talked down to his team. Here’s a clip discussing just what exactly they were facing. These are a group of just out of college kids, playing for basically no money. Players who could have gone to the NHL and made bank, but were playing for their country. Everyone in the world thought they were going to get humiliated. There’s a scene in Miracle that’s a conglomeration of incidents that happened in training. The team is goofing off, planning dates with cute girls in the stands, when they are in the middle of a game and representing their country. Herb doesn’t let them go to the locker room after the game, but instead forces them to run drills, telling them “if you’re not going to work during the game you can work now.” This is an amazing, pivotal part of the movie and cutting it up for this post nearly killed me. I wanted to be like, “here, watch this 15 minute scene!” but that’s a bit much. I don’t know about you, but for me as a writer this is hugely comforting. At first glance it looks as if he’s knocking their level of talent. He’s not. This was an incredibly talented group of kids. But just having talent isn’t going to win against the best in the world. There are days I think I’m a pretty talented writer. There are days I think I’m absolute crap. The reality, much like for the boys on the 1980 hockey team, probably lies somewhere in the middle. But I don’t have to rely solely on whatever “natural talent” I may or may not have. I can take that talent and improve on it with hard work. I can’t control how much talent I was born with, but I can control how much I work I am willing to put into my craft. After running the blue line drill another four or five times, Herb tells them “Win, lose, or tie you are going to play like champions.” That’s the flip side. While it’s comforting to know that you can improve with work, it also means you can’t let yourself down by showing up with anything less than your A game. It’s part of your responsibility to yourself to always play at the highest level. No game, no story, no book, is a throw away. For the kids on this team it was even more of a responsibility. They weren’t just representing themselves, they were representing their teammates and their country. As Herb reminds them, the name on the front of their jersey is more important than the name on the back. And here’s part two, the conclusion of the blue line drills scene. Two things stand out for me here: “You better start playing at a level that FORCES me to keep you here.” This is a huge goal for me: to write at a level that “forces” readers to sit up and take notice. To be good enough to not be ignored. There’s a huge difference between saying you’re good and letting your work speak for itself. There’s a heck of a lot of back end effort that goes into getting your work that good. In any endeavor, whether sports, or writing, or business, being that good isn’t just about the talent, it’s about the work and continuously getting better. “This cannot be a team of common men, because common men go nowhere. You have to be uncommon.” Again, it could sound here as if Herb is saying that they’re uncommon based on their talent. Not so. They’re uncommon because of the level of dedication needed. They’re uncommon because of their willingness to give everything, to leave every piece of themselves out on the ice. He’s giving them a choice here. Being uncommon is a choice, it’s not something they were born with. Again, it so reassuring to me! I can make this choice. In an earlier clip, Herb said that the Soviets relied on intimidation. They know they’re going to win and so does everyone they play. Herb then did something that seemed insane to most people. He had his team play an exhibition game against the Soviet team at Madison Square Gardens just DAYS before the start of the Olympics. Unsurprisingly, the Americans were crushed. Absolutely humiliated. Sometimes you have to face and live through your worst fear in order to be able to conquer it. You have to go through the trial to learn how to emotionally deal with it, to let go of the grip the possibility of defeat has on you. Every writer is going to get a bad review. Every writer is going to work on a project that takes so much out of you emotionally and yet doesn’t turn out how you want. I know as a writer I fear these things…but there’s something almost freeing about facing them. It might not be quite the same as facing the Soviet Team and getting humiliated on your own turf, but there’s a part of me that almost looks forward (in a sick, twisted, “I want this to happen but I really don’t” kind of way) to a new release’s first bad rating or review. Why, because I KNOW they’re coming. No matter how great a book is, there’s going to be someone somewhere that hates it. There’s something to be said for getting that inoculation over. Once you’ve had a taste of defeat, it’s not quite as scary. Then the Americans met the Soviets in the Olympics. The fear was gone. The training and planning had all led up to this night…and the ironic thing is, this wasn’t even the gold medal match. But it is the one that everyone remembers. It’s the one that captured the attention of the nation and of the world. No one expected the 1980 team to even place in the Olympics and here they were about to play the best in the world, a team that had just trounced them soundly the week before. I adore this speech. What’s amazing is that Herb Brooks wrote this speech down and he related it to the press later. This is not Hollywood. This is what Herb Brooks really said that night. Great moments are born from great opportunity. And that’s what you have here tonight, boys. That’s what you’ve earned here tonight. One game. If we played them ten times, they might win nine. But not this game. Not tonight. Tonight we skate with them. Tonight we stay with them. And we shut them down because we can. Tonight we are the greatest hockey team in the world. You were born to be hockey players, every one of you. You were meant to be here tonight. This is your time. Their time…is done. It’s over. I am sick and tired of hearing about what a great hockey team the Soviets have. Screw ‘em. This is YOUR time. Now go ou there and take it! Maybe rough drafts fall from your golden fingertips like nectar from the gods – perfect and perfectly edited the first time around. Maybe you have to fight and wrestle with each phrase. Maybe it’s somewhere in the middle. Either way, you must go out and take it. You must work for your goal and then reach out and grab it with both hands. It’s not just about the “talent” you were born with. Our fates weren’t decided for us. Train hard. Get to the place where you can skate with the best for a whole game. Be so good that people are forced to notice. Don’t be afraid of failure. Go out there and take it! So was the 1980 team really a “Miracle on Ice?” Yes. But it wasn’t a miracle that happened during that one game, on that one night. The miracle happened every time they didn’t give up, every morning they woke up early to train, every time they gave more than they thought they were capable of. They earned their miracle. And we can too. If you’ve never seen Miracle, you really should. As a spoiler, here’s that famous “Miracle” call (and the iconic medal ceremony). The movie makers had the original announcer who called the 1980 game come in and redo all of his audio…but no matter how many takes they did they couldn’t capture the pure, unadulterated joy of the “Do you believe in miracles? Yes!” line and had to use the original audio from the 1980s Olympics broadcast. « A Wallflower Moments Blog Tour with Maya Rodale! There are just some movies about sports that stay with you. This is one. Great Post Jennifer and thanks for the kick in the pants. I needed it this week. Glad it spoke to you, Amy! So much truth here. I’ve been afraid to go see this movie because…well because of a lot of reasons. But chief among those reasons is that I remember exactly where I was when the game was on and what I was doing. Like when Kennedy was shot or the moon landing for my parents, and the Challenger Disaster and 911 for me. That’s how much emotion is tied to this single game. I don’t want to watch a movie that will somehow destroy those feelings that I hold close. But the idea of never giving up? Of keeping going? Of all those pep talks? That I might need to hear despite my fear. I suppose that’s ultimately the point, right? Thanks, Jennifer. Great post. I’ll never forget that game. It truly was a miracle. I was in college and we screamed and screamed for what seemed like hours on end. Never give up and never give up on the dream. What a great memory, Nancy! But I love the break down you do of this speech/movie and its inspiration. Great words all around! Wonderful post. I remember those games. Tweeted.